A U.S. Internal Revenue Services employee holds signs in front of the federal building at a rally against the U.S. federal government shutdown, in Ogden, Utah, Jan. 10, 2019. The U.S. Senate on Thursday night unanimously passed a bill guaranteeing federal workers they will be paid everything they are owed when the government shutdown ends. While it sounds like good news, it will not immediately help more than 800,000 workers who this week are missing their first payday since the shutdown began Dec. 22. When the shutdown enters its fourth week Saturday morning, it will set the record for the longest in U.S. history and there are no signs a negotiated settlement is in sight. Democrats are refusing to give President Donald Trump more than $5 billion to build a wall along the U.S. southern border with Mexico. Without an agreement on funding a border wall, Senate Republicans and the president are refusing to approve funding for eight federal departments, leading to a partial shutdown of the U.S. government. In his continued crusade to convince Congress and the American people that a wall is needed between Mexico and the United States, the White House says Trump will hold a roundtable discussion on border security and safe communities Friday afternoon with state, local and community leaders. Trump says a wall is needed to stop illegal immigration and the drugs and crime he says come with it. 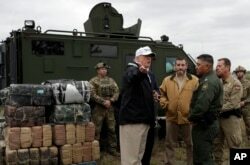 U.S. President Donald Trump talks to the media as he stands with U.S. Border Patrol agents on the banks of the Rio Grande River during his visit to the U.S.-Mexico border in Mission, Texas, Jan. 10, 2019. A declaration would allow Trump to spend the money without congressional approval. It would likely bring an immediate court challenge from Democrats who say there is no emergency at the border and that the president would be overstepping his constitutional authority. President Donald Trump tours the U.S. border with Mexico at the Rio Grande on the southern border in McAllen, Texas, Jan. 10, 2019. While in McAllen, Trump visited a Border Patrol station and inspected a table heaped with illegal drugs and weapons. He was told most of the contraband was seized at legal points of entry — not the remote border crossings the president says need to be sealed off. The president also met with the families of those killed by illegal immigrants. Trump said a “wall works.” He made the promise of a wall the centerpiece of his 2016 campaign and insisted Mexico will pay for it. Who pays for the wall? Although, this contradicted statements he made during the campaign, Trump has more recently said the benefits from a renegotiated North American trade agreement would lead to Mexico paying for it. Most Democrats say there is a need for more border security but that a wall is impractical, wasteful and immoral. Even some conservatives are beginning to wonder whether it’s an issue that makes it worth shutting down the government. Trump is blaming the government shutdown and impasse on wall funding on the Democrats, especially House Speaker Nancy Pelosi and Senate Democratic leader Chuck Schumer.